Kit asamblare Tanc Jagdpanzer IV/70 (V) Lang scara 1/16 produs de TAMIYA – firma recunoscuta pe plan mondial pentru calitatea finisarilor si pentru acuratetea detaliilor. Acesta este un kit de montaj, neasamblat, nevopsit. Fotografiile sunt cu titlu de prezentare. Pentru a asambla si rula modelul aveti nevoie de vopseluri Tamiya, scule de modelism, sistem radiocomanda, acumulator pentru rulare si incarcator pentru acest acumulator. This is a 1/16 scale R/C model assembly kit of the Jagdpanzer IV Lang /70(V), an L/70 7.5cm gun-toting German tank destroyer that proved a fearsome opponent for allied armored vehicles after its appearance near the end of WWII. The smartly-sloped, low form is recreated with aplomb, and separate parts are included to accurately depict Schürzen armor, tools, spare track links and other accessories. A sturdy base is provided by the chassis with numerous metal parts. Pair this model with a separately sold 4ch R/C system to take control of a whole range of tank and gun ments, with highly realistic sounds synchronized with the model's actions, not to mention gun recoil, vehicle kickback and more. Take it a step further, and add the separately available Tamiya Battle System to have mock battles with other Tamiya R/C tanks. Front-mounted pre-assembled gearbox features twin Type 380 motors for plenty of power. Highly realistic running is provided by a durable frame employing metal chassis and drive sprocket parts, plus leaf sprung bogies; take on uneven terrain with confidence! A precision made aluminum gun barrel accurately reproduces the main gun which protrudes from the distinctive “Saukopf” mantlet. When firing, main gun roars and muzzle flashes thanks to a flashtube in the barrel. The barrel recoils after firing via the fighting compartment interior gearbox, and then returns smoothly to the original position. Vehicle kickback is also recreated by the drive gearbox. Despite fighting in a losing cause, the German Jagdpanzer IV Lang /70(V) and its L/70 7.5cm gun quickly proved a fearsome opponent for allied armored vehicles after its appearance near the end of WWII. Like its L/48 7.5cm shorter-gunned predecessor, the Lang used the tried and tested Pz.Kpfw.IV chassis with a smartly-sloped covered fighting compartment on top. It was dubbed “Lang” (German for “long”) to differentiate it from the L/48 gun variant, with /70 denoting the caliber and (V) its manufacture by the company Vomag. 930 Jadgpanzer IV /70(V) Langs were produced between August 1944 and March 1945, and fought with tenacity in actions such as those along the Ardennes front from December 1944, their exceptional range and power troubling Allied forces until the last. -Gun offers 12°elevation and 4°depression, with movement controlled via a 4ch transmitter. -24°of traverse is also controlled via transmitter, with the sight cover sliding in simultaneous movement. -Machined aluminum gun barrel lights up dramatically when the model fires thanks to an internal flashtube. -A 7.92mm machine gun provides another firing option with light and sound, and has a movable flap. -Recreate Zimmerit anti-mine coating with the included 3D zimmerit sticker sheets - just cut and apply! -A precision-machined aluminum part recreates the imposing L/70 7.5cm main gun with real aplomb. -Finely-molded resin tracks offer superb realism. They feature metal pins for secure and authentic motion. -The front-mounted, pre-assembled gearbox powers the models via a pair of Type 380 motors. -The included DMD Multi-Function Control Unit MF-05 coordinates lights and sounds with model motion. -Included DMD Control Unit T-03 lets you control the motors, plus gun movement with 4ch transmitter sticks. -Rear-mounted speaker unit features a bass reflex system with metal plate, giving deep, rich sounds. -Length: 532mm, width: 202mm, height: 130mm. Weight (approx. ): 2,770g. -Sloped form and L/70 7.5cm gun are reproduced with accuracy. -Separate parts are used to recreate accessories including hull-side Schüzen armor plates. -Model features forward and reverse movement, plus a range of turns from on-the-spot pivots to gradual ones. -Highly authentic sounds, and gun flashes are synchronized with the movement of the model. - Included DMD Control Unit T-03 has two FET speed controllers for operating two running motors and allows control of various tank f unctions. - Requires a 4-channel transmitter with self-neutral function, battery pack, charger and transmitter batteries. 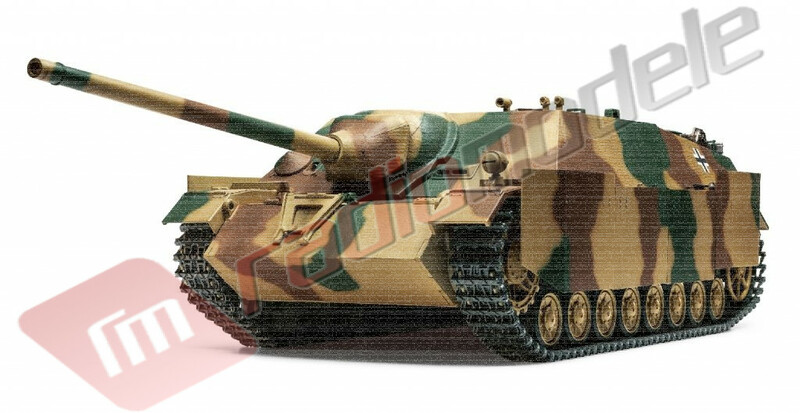 Tanc Radiocomandat Tamiya Jagdpanzer IV/70 (V) Lang - Full Option Kit, Scara 1:16.